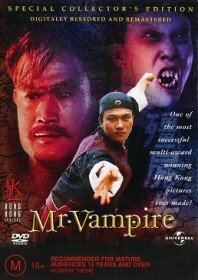 A smash hit movie, Mr. Vampire has developed a cult following over the years. The unique blend of supernatural horror, comedy and kung fu – the first success of its kind – created a new sub-genre of its own, and the cash-ins and sequels quickly followed. But this is the original, and still the best. Lam Ching-ying plays a Taoist priest and master of young disciples Chin Siu-ho and Ricky Hui, whose decision to harbour a wealthy man’s deceased father overnight quickly turns into a nightmare. Over the years the decaying corpse turns into a nasty Chinese vampire, now resurrected and hopping about the streets in Ming Dynasty costume. The priest has enough magic to keep the fiend at bay, but soon the vampire’s son is infected, and then his pupil Ricky Hui starts turning pale and growing his fingernails. The most interesting subplot involves Chin Siu-ho’s relationship with a female ghost (Pauline Wong) who casts him under her spell, gives him creepy love bites and takes him back to her place. The priest is quick to work his skills, exploding the ghost’s flying head with a glow-in-the-dark dagger. There is a great balance between the suspense of the horror scenes and the film’s spirited humour, best demonstrated in a scene where the leads evade capture by holding their breath, with a member of the walking dead sniffing furiously inches from their face. Fun all the way, this one is difficult not to like.